Frontal fibrosing alopecia (FFA) is said to be a subtype of Classic Lichen planopilaris (LPP). The two conditions have many features in common but also have many differences. LPP and FFA are nearly indintinguishable by scalp biopsy although biopsies from patients with FFA generally have less inflammation than biopsies from LPP. In addition, patients with FFA are frequently much more likely to be asymptomaric compared to patients with LPP. The scalp is less likely to be itchy, and less likle to be red. Patients with FFA at the sides of the scalp (around the ears), frequently have no scale (unlike LPP) and may or may not have much in the way of redness. Because FFA is often so “quiet”, this can frequently delay the diagnisis - sometimes by many years for affected patients. This photo show typical feaures of FFA. A large number of single hair follicles are seen. 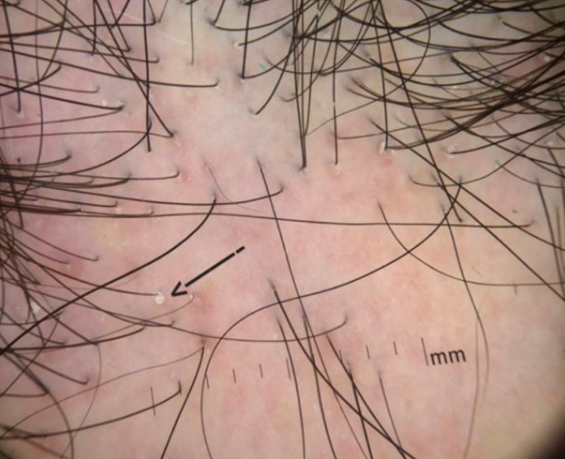 Occassional hairs have white scale around them (perifollicular scale, see arrow) and several follicles have redness around them as well (perifollicular redness). Treatments for FFA and LPP are very similar but not identical. Finasteride for example is more effective in FFA than LPP. Poblet et al. Frontal fibrosing alopecia versus lichen planopilaris: a clinicopathological study.